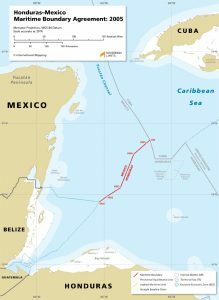 The maritime boundary between Honduras and Mexico was established through a bilateral agreement that was reached in 2005. The boundary extends from a potential tripoint with Belize in the south to a tripoint with Cuba in the north following a simplified equidistance line. Guatemala protests the provisional tripoint with Belize due to its own unilateral claims in the area.